Caroline Fylpaa, designer-weaver of the Prairie Points technique, shares her most recent creation, a prize winning summer outfit worn with great style at her son's wedding. 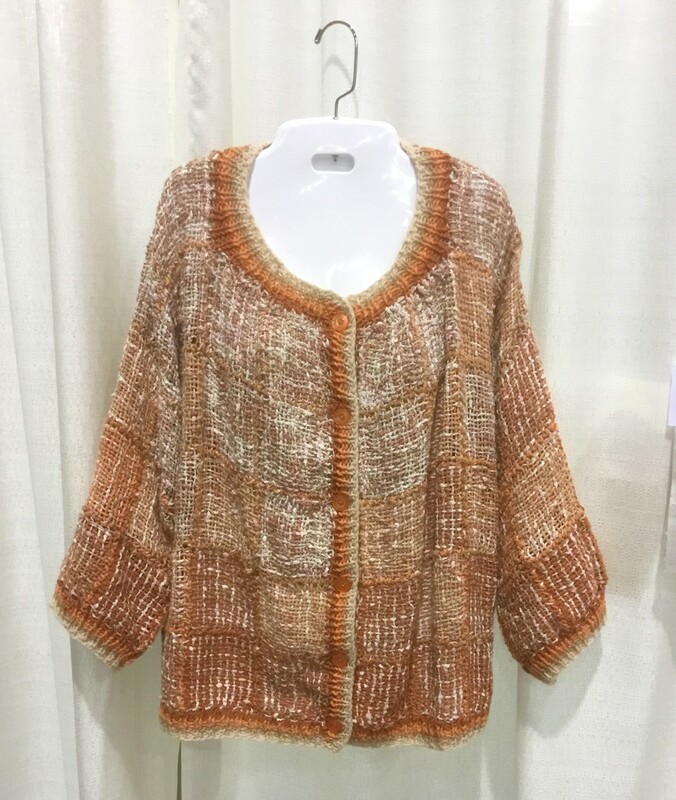 She reported, "the shell was made with a stripe on the left side front to back, the skirt was made of alternating striped and plain blocks set on point, wool and rayon, rayon mix, stripes were rayon boucle, perfect for a summer wedding and party." And in addition to winning all our applause for the "Fabulous Hand Designed and Handmade Mother of Groom Outfit of the Year," she took home a two ribbons as well! Stay tuned, Caroline has promised to send further information on her pattern including how she worked that perfect fit. I am hoping that she will also give us details about those two ribbons. Congratulations, Caroline! 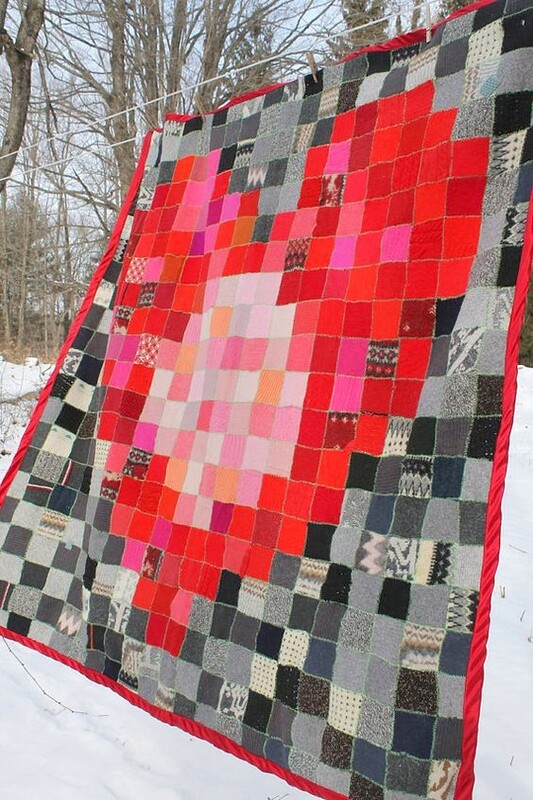 If you haven't seen Caroline's Prairie Points blanket, check it out here. 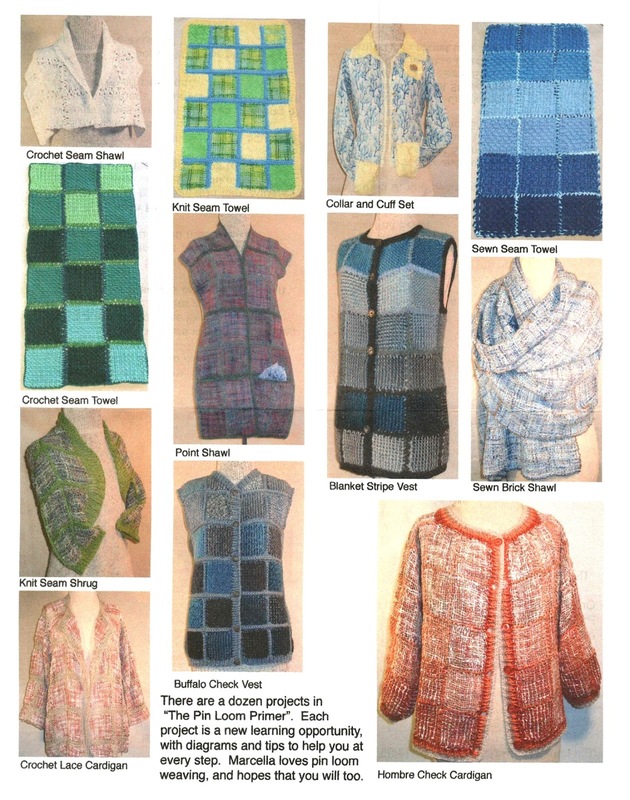 The Sept.-Oct. issue of Handwoven is now out and features an article on the Pin Loom Zebra. 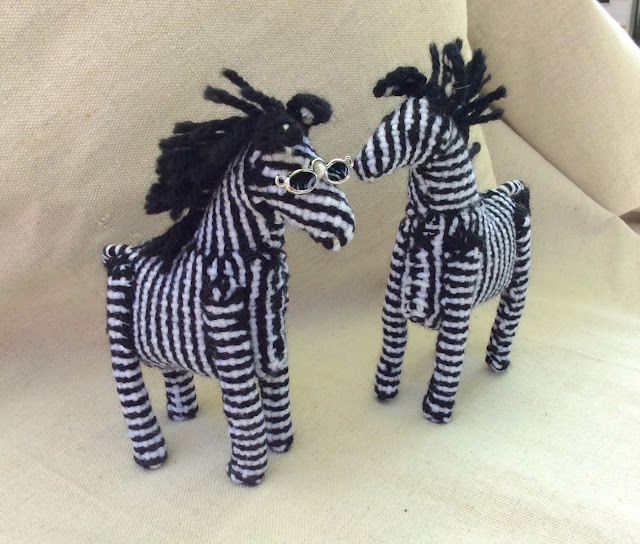 Check out the dazzling article at A Dazzle of Zebras. Zebra recently returned home from the Handwoven magazine shoot and may have gotten a big head over the article. I mean, sunglasses? 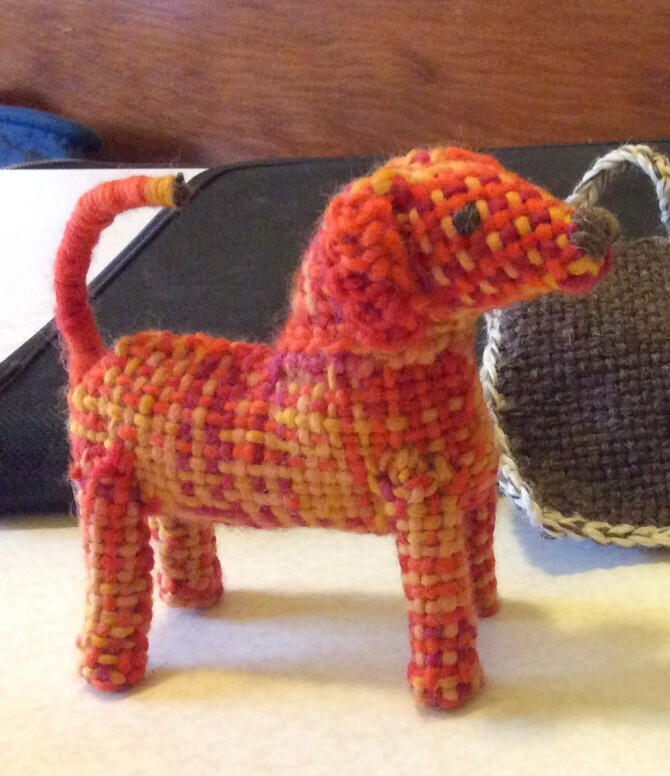 Check out the series of companion animal weaving patterns called Pin Loom Primitives now available through the Pin Loom Weaving Shop. 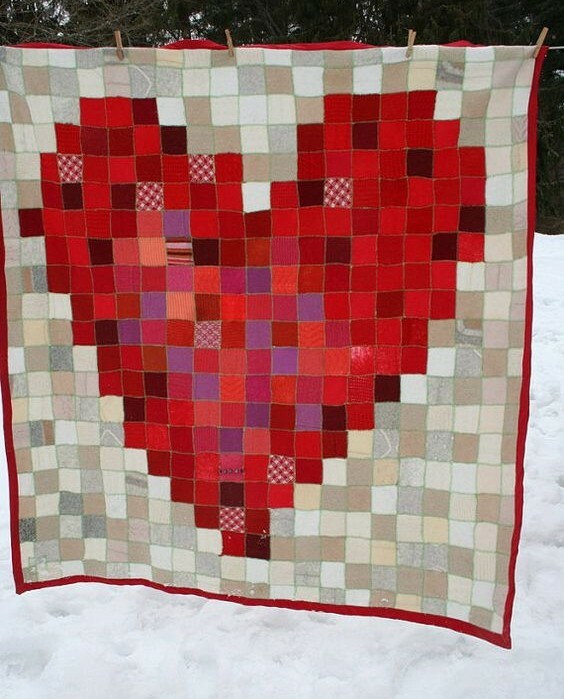 Update: This free pattern is now located in the Pin Loom Pattern Shop. This is a new pattern based in part on the approach of using one square to make rabbit ears, head and body. This rabbit is made with a 4 x 4" square for the body plus several 2 x 2" squares for the front and back feet. This is a free pattern just in time to add a few bunnies to an Easter basket. This is a fun pattern to make and may explain why there are so many rabbits running around. 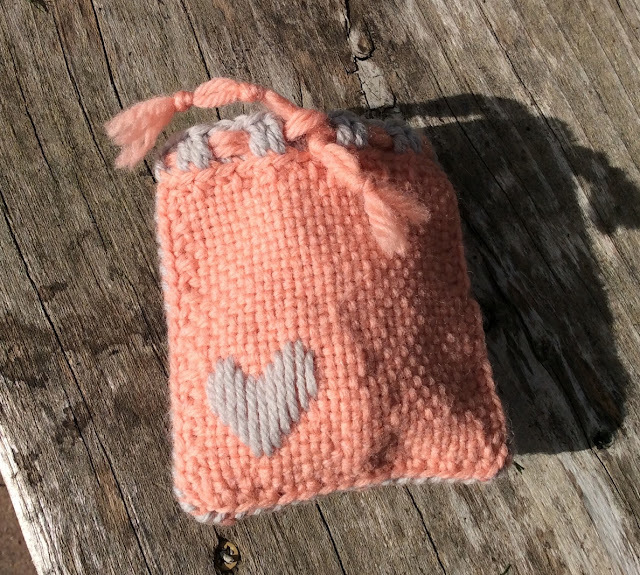 The rabbit pattern has just been updated to include a fun, easy pattern for a little carrot to go with the little rabbit. Click HERE or click on the Pin Loom Pattern Shop page to download the free PDF instruction sheet for rabbit and carrot. Looking for a simple woven gift or badge? This is a great little sheep pin that is made using two 2" x 2" squares sewn together with a little batting and a pin back. I can't wait to make a bunch of them! If I need a small gift its going to be perfect. 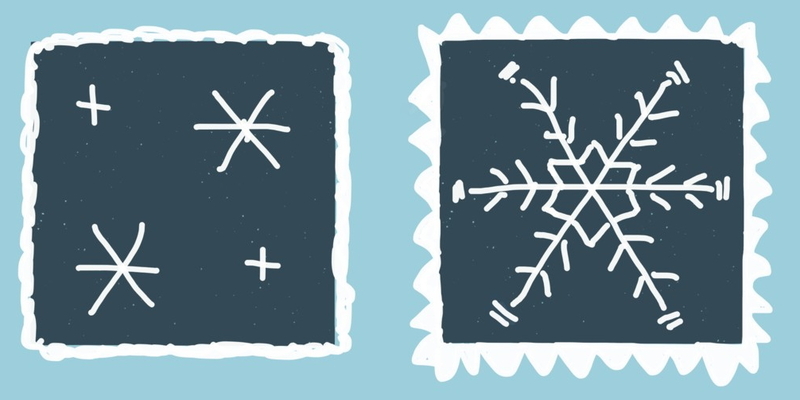 If I have a big gift to decorate, this little pin will make a great embellishment. And if I need a pin loom related item for multiple goody bags, this little Lamb Pin hits all the marks. Choose your favorite fleecy looking yarn, add head and feet in satin stitch. What better way to introduce pin loom weaving--it's ease, it's usefulness, than by sharing an easy to make and unique gift. This is a simple 2" pin for scarf or embellishment. 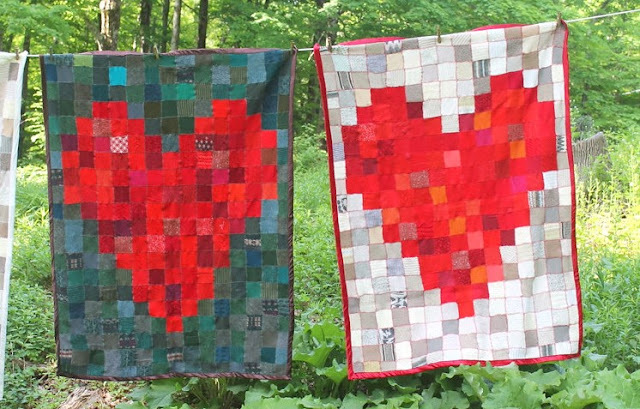 Its made with two 2" x 2" squares, a couple of very small squares (about 1 1/2" x 1 1/2") of quilt batting or other soft cloth like fleece to add some body, plus a pin back. The sample shown here uses a 1 1/2" pin back. 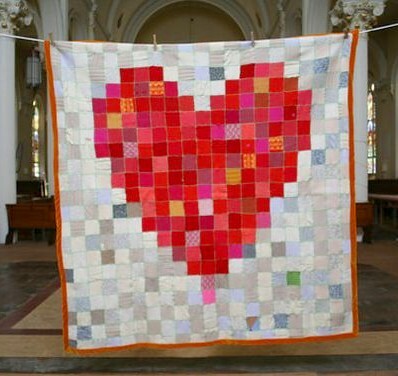 The body of the pin back is buried between the two layers and sewn to the back layer. All that shows is the pin and clasp. Cameras have always been an important part of summer activities and this camera bag captures that sense of summer adventures while being an easy to weave accessory. Phones have taken over all the duties of picture taking, but this bag reclaims the spirit of the camera. 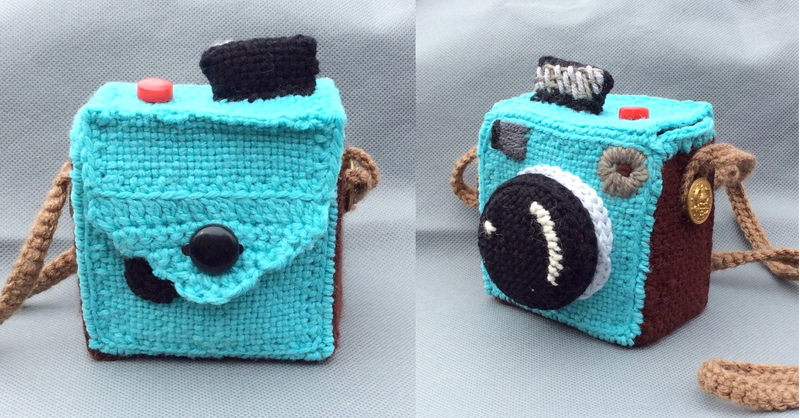 This pin loom woven camera bag is constructed from 4" x 4" squares. The brown side and bottom panels have been turned in to make a slimmer side profile. On the inside there is plastic needlework screen stitched to the side and bottom squares to give it a more rigid frame. I wanted a very easy and carefree finish for the inside, so the interior is finished with bright pink duct tape. Its waterproof, makes it easy to see into the bag and adds some stiffening to the sides. The turquoise body of the camera bag was joined by using a single crochet around each square, then whip stitching them together. The brown sides were joined using a double overcast stitch (you can find more information on the joins in Pin Loom Essentials) turned in around the plastic screen and stitched to the turquoise front and back with a whip stitch. 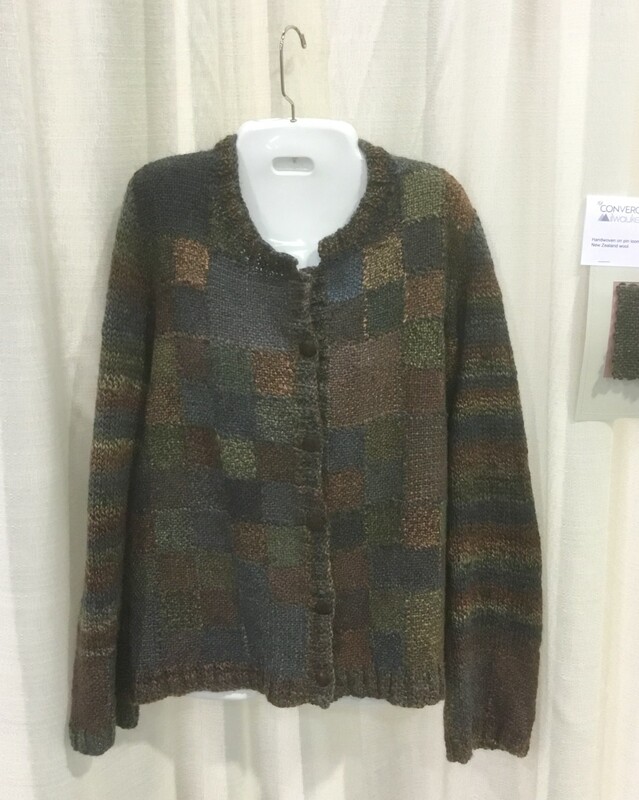 You can see that there is a crocheted tab in the back. The black button on the tab covers the top section of a purse magnet. The little red button on the top of the purse is just a little red button that appears to have been created specifically to look like an old camera shutter button. I wanted the purse strap to look like an old-fashioned leather camera strap. It is a 32" crochet chain with one line of half double crochet. The ends have a long chained loop to allow them to loop easily over the brass buttons on each side. This is the camera before final assembly. I was in the process of sewing on the purse magnet closure when I took the picture. The yellow stitching was to help me determine where the top should fold down the back. 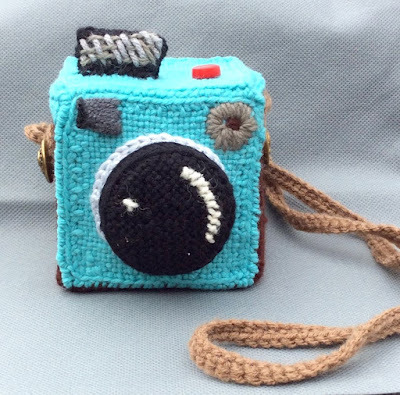 I am hoping to someday put together a whole collection of funky, pin loom woven faux camera bags. These are other cameras that I would like to recreate as woven bags. After all, can the world have too many fun handbags? I think not. 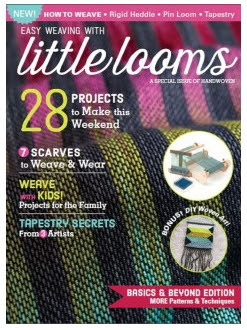 When I finished writing Pin Loom Weaving; 40 Projects for Tiny Hand Looms, I turned to my husband and friends and said, "That's it, never again." 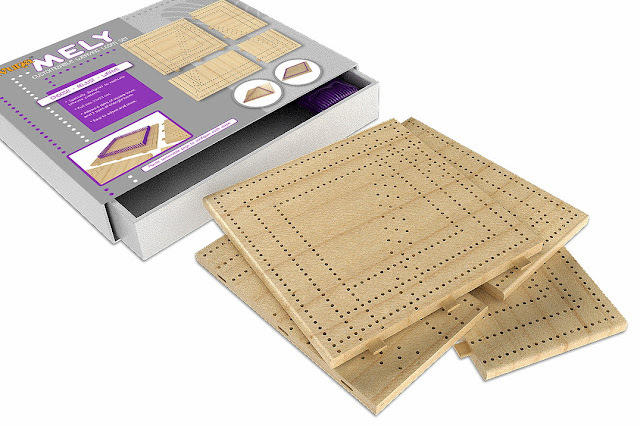 After all, I had just written down pretty much everything I knew about pin looms and I found out that writing a book is more difficult and way less fun than weaving. 2) I began to think about a cool new ways to weave. So for the past year I have been working on two plans. Regarding the animal patterns, you should soon be seeing more pin loom animal patterns online- starting with the free rabbit pattern. 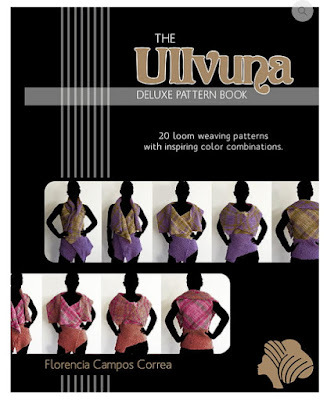 And I have been writing a book with lots of new pin loom patterns using a variety of approaches to pin loom weaving. FYI, it turns out that writing a book the second time is just as difficult and frustrating as the first time. 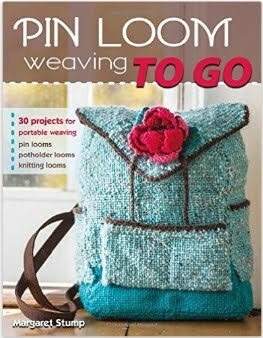 You can be sure that I will proudly let everyone know when the new pin loom weaving book date gets closer. Right now it looks like it will be available in March, 2017. In the meantime I wanted to give you a look at some of the ideas that have gone into the book. 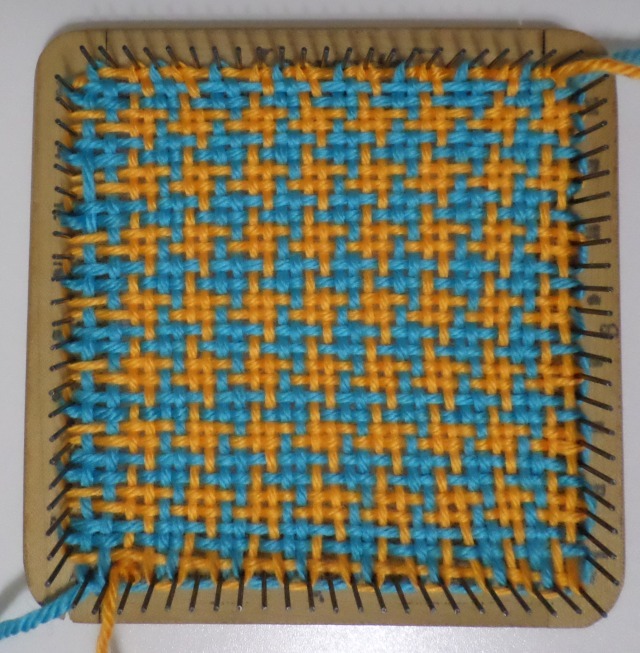 I have always wondered if it wouldn't be possible to pin loom weave on a potholder loom, considering that the potholder loom also has pins all the way around. But I was never happy with having to use loops and finish it off with a crochet type edge. So there are a series of patterns in the new book that are woven, with a finished selvage, on a potholder loom. 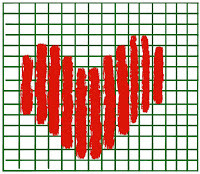 The effect is more open and loose than using a 4" loom like the Zoom Loom. The potholder loom works very nicely for scarves and shawls. It also makes it possible to weave large pin loom squares with much heavier yarns. 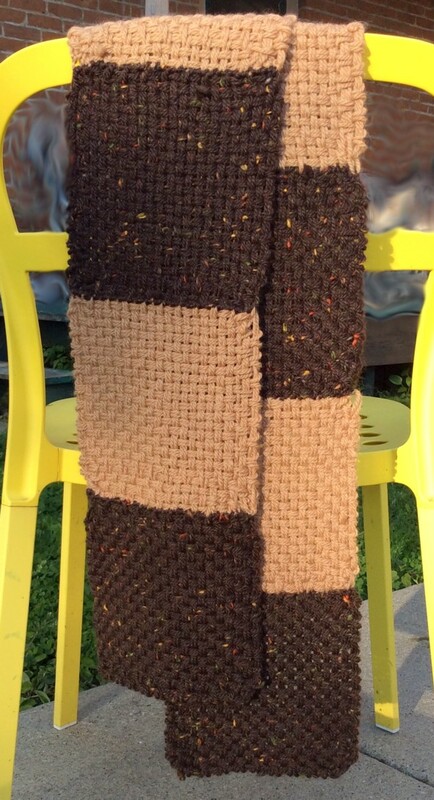 The scarf below is woven from Isaac Mizrahi super bulky yarn, which makes it a colorful choice for Minnesota winter wear. So keep an eye out for more animal patterns, its taking a while but they will be available soon, and I will be posting more information on the new pin loom weaving book as the publication date gets closer. I am lining up a number of workshops for this summer and fall. Please check on the 2016 Pin Loom Workshops page for the dates and locations. I am still working on the list and there are a few late-in-the-year fiber fairs still pending so you may want to check back in the future. I hope you find something that interests you! We will be doing 2-D and 3 -D projects as shown here. This is the year of Convergence, happening this summer from July 30 to August 6, 2016, in Milwaukee, Wisconsin. 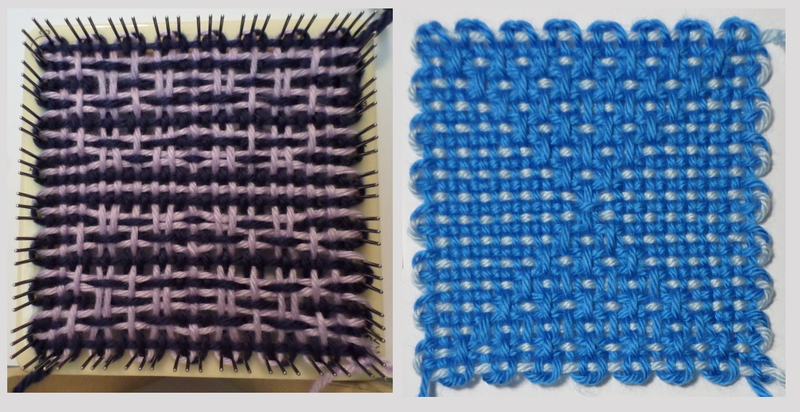 I am going to be teaching three courses on pin loom weaving! Yes, I am very excited. I am doing an introductory course for people who have not woven on pin looms at all. 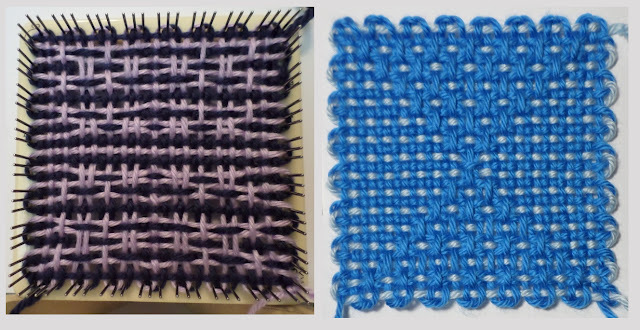 I am doing two courses for pin loom fans that will be all about weaving and constructing objects that can be completed during the class: sheep, owls, and cats. 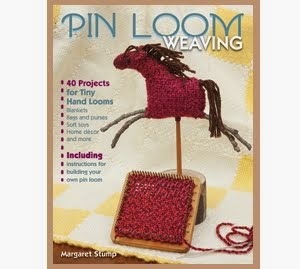 Check out all the details on the Pin Loom Classes page. Click this link for the main Convergence page to go to the official website for registration. 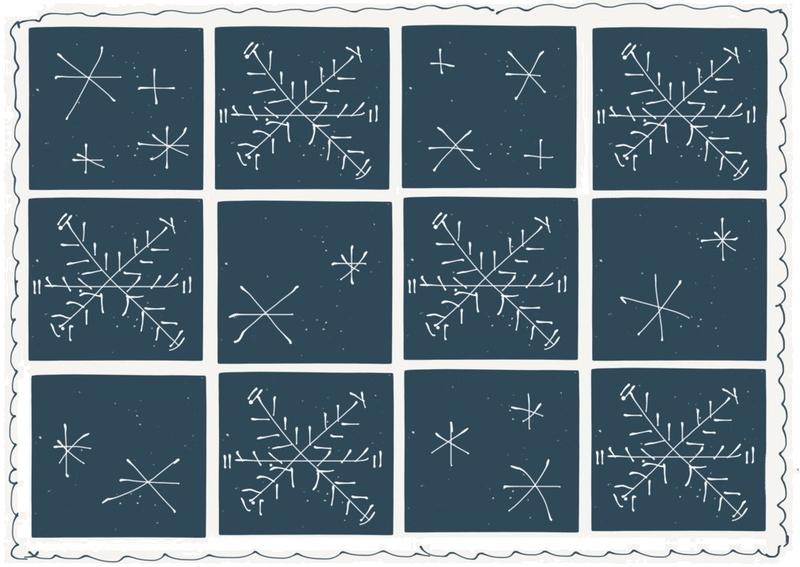 Because Convergence only happens every two years, class openings can go fast, so check it out. We will be weaving an Owl and Pussycat with plans for a Pea-Green Boat. You can weave a pasture full of sheep. 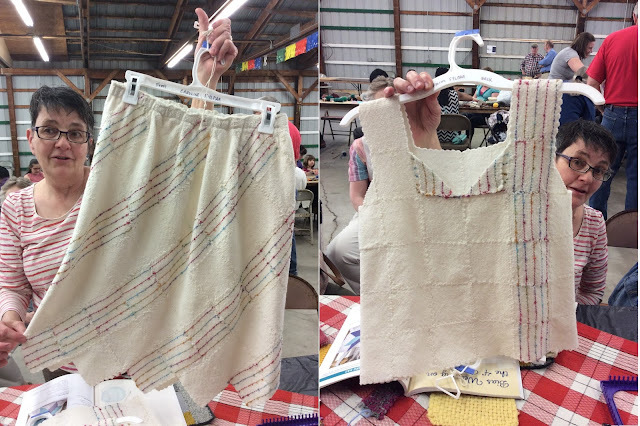 You can weave a sample sheep for each sample fleece! As pin loom addicts, I mean fans, many of us began our weaving journey as kids, playing with that most humble of hand looms, the potholder loom. 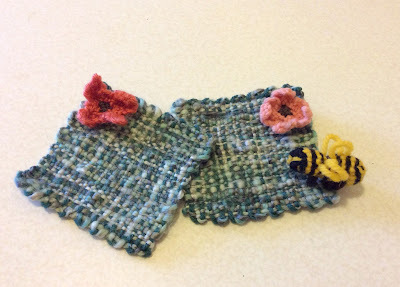 I have long considered the potholder loom to be a great potential pin loom and recently discovered a way to pin loom weave on it (but that's another story). What I never considered asking myself was "What would a potholder loom be like if it was really, really large?" 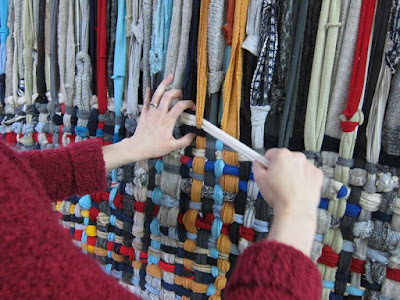 Luckily for all of us, Crispina ffrench has asked and answered this question, sharing a vision of potholder loomed rugs made from upcycled materials and marvelous design. 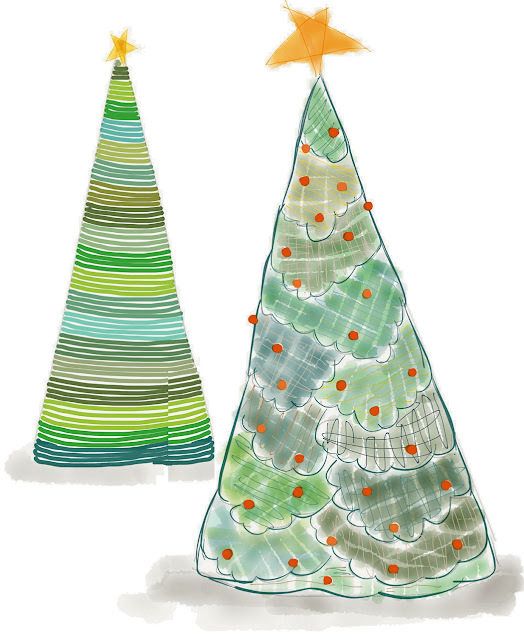 Crispina introduces herself as a recycled textile artist, author, teacher – creator of many things. She shares her work and inspiration at Crispina.com. Tired of using teensy little pin looms? 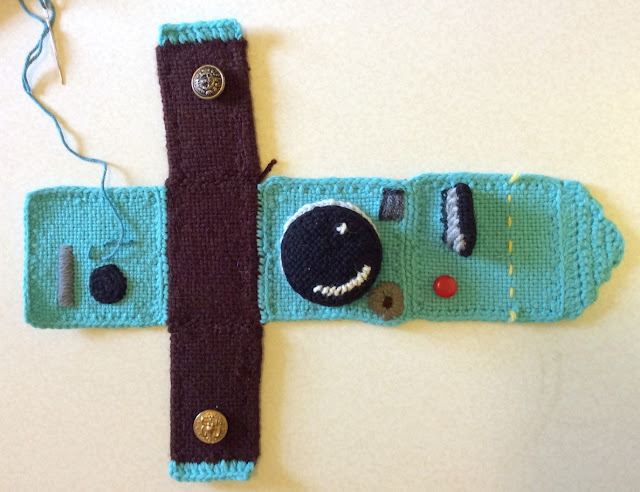 Go to the EVENTS page to find out about Crispina's planned workshops including an opportunity to make your own potholder rug. Here is a closeup of a potholder rung under construction. I would be interested to learn what they use to beat in the space between the weft rows, maybe they're just using their fingers. 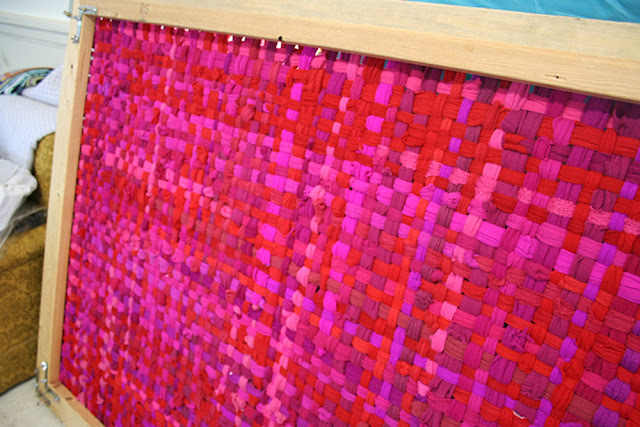 As brilliant as these random colored weaves are, I was especially drawn to to the rugs that emphasize one color. What fun to think about searching out all of the gold or red cast off clothing one can find! Many thanks to Crispina for sharing her vision. This is a question from a new pin loom weaver. Hello. I have searched the web for this annoying problem that I have with my 4 In. 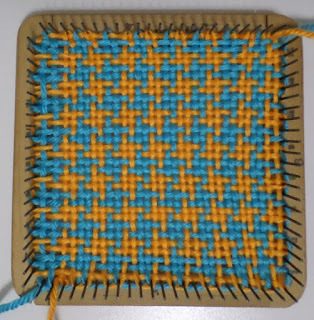 square loom. I just started weaving these lovely squares but I am doing something wrong because when I pop them off, they all have one side where the yarn is loose, almost looks like a picture hanger wire at the edge. What am I doing wrong? Thanks for any help. I am so glad that you have written about this. 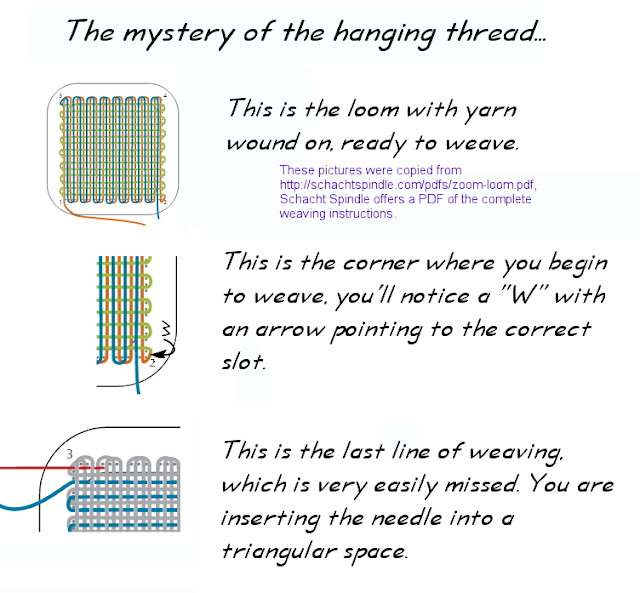 This is a common problem for all or most new pin loom weavers (it happened to me a lot and I have a feeling that there are other people out there nodding, too). 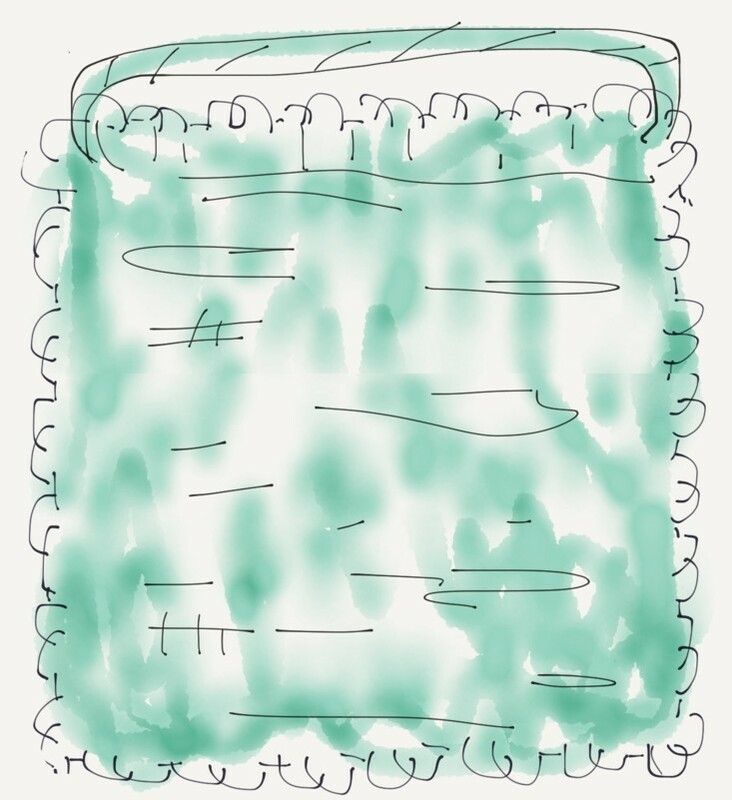 What is happening is that you are not completing the weaving, you are leaving either the first row or the last row of weaving (probably the last) unsecured. I have actually managed to leave a loop at each end-- yes, I missed weaving both the first and last rows. The problem is that it can be difficult to figure out exactly where to start weaving and the last row in particular is very easy to miss. 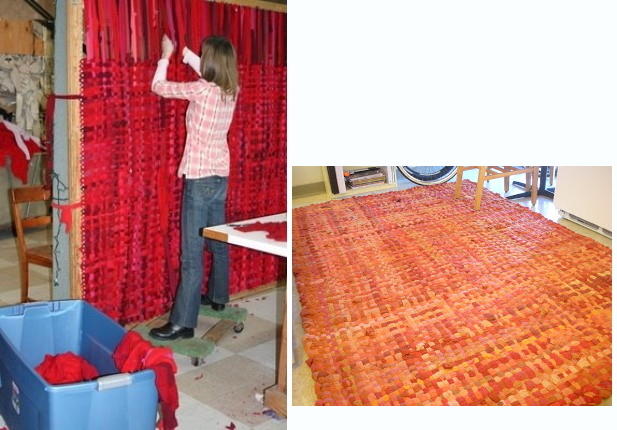 Below are some pictures that I copied from the Schacht Zoom Loom weaving instructions to illustrate the issue. Start weaving in the same corner as the #2, you will be inserting the needle between the first and second pin. For the last line of weaving, you are inserting your needle into a small triangle. This last line is often pretty tight and may take some patience to weave. This is a great place to use your fork as a beater to move the lines of weaving down and give yourself more space to see and weave this last line. I hope this helps. But please don't be discouraged, you have just taken the second step into pin loom weaving. 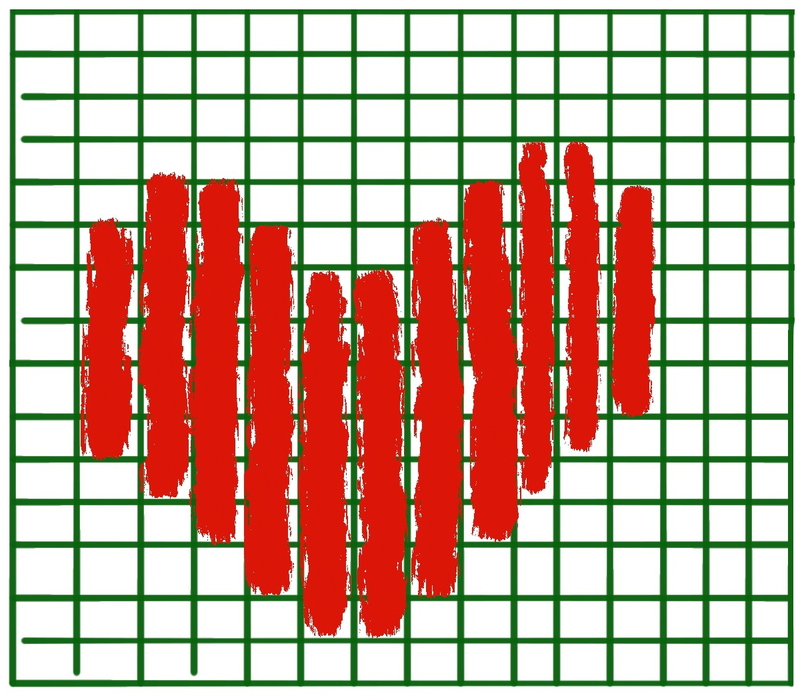 For me, one of the delights of the web is the ability to see what other people are doing and weaving. I have been particularly delighted to see the weaving being done by Sue Burton at Windswept Mind. I was introduced to this site by a friend who is using Burton's carefully laid out instructions to weave houndstooth squares in linen. This is an example to the right. 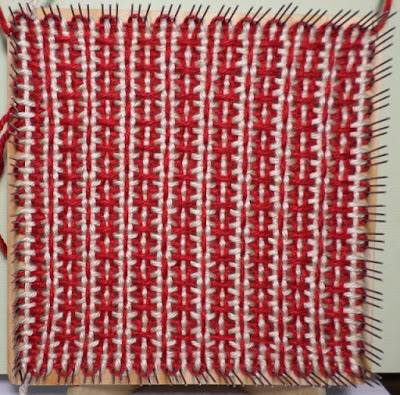 She notes, "I learned the houndstooth check pattern from the book 100 Pin Loom Squares by Florencia Campos Correa. 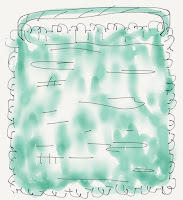 Loved the square, but thought her instructions were insufficient, so I’m writing my own–with photos. I took LOTS of photos and I hope they help anyone who wants to learn this stitch." Ms. Burton has taken the time and care to weave some extraordinary squares and to explain how to get consistent results. I would suggest that you bookmark her site and visit it often as she builds a library of stunning weaves and techniques. 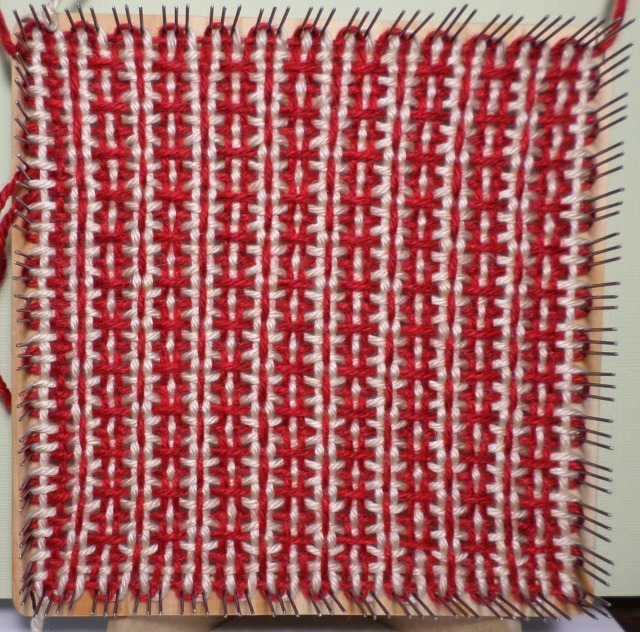 To find the information on weaving techniques, click here or go to the home page and click on the category, "Pin Loom Patterns." Sue's Zoom Loom friendly patterns are demonstrated on a Weave-It Loom as well as on a Loomette. I especially want to give her props for the use of the Loomette, a really handy and underutilized vintage loom design. My work has emphasized tabby weaving combined with variable yarns or strong color contrasts. 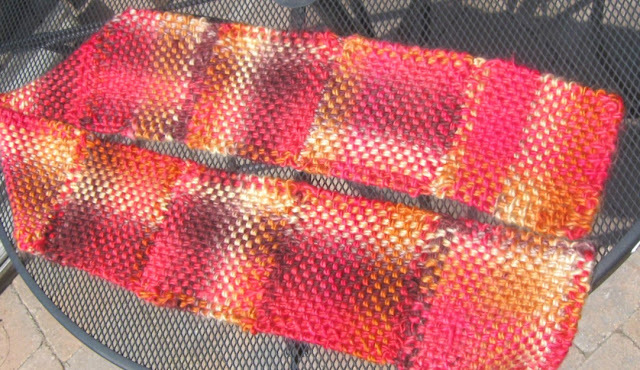 Sue is weaving squares that beg to be turned into scarves, hats, vests and other people friendly wraps. Thank you for sharing your lovely work with all of us. 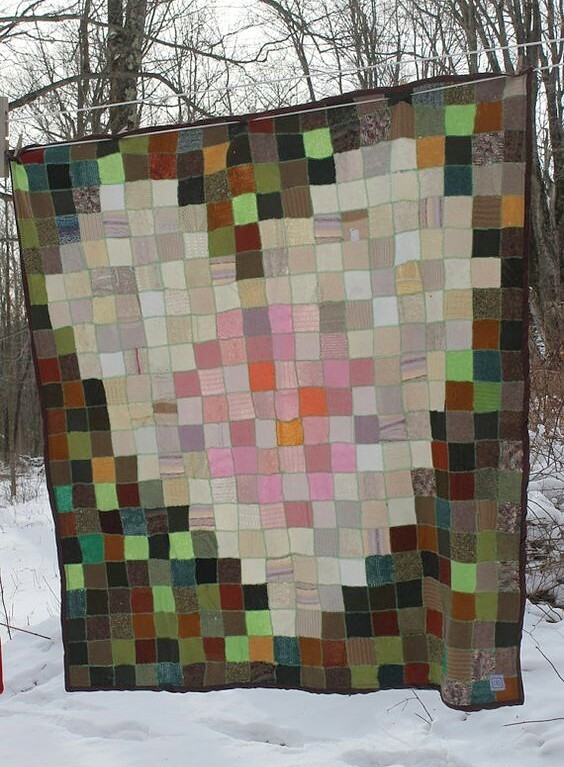 Check out the site: Windswept Mind; Pin Loom Patterns.